Begum was born with arthrogryposis, a rare congenital disorder that causes severe joint contractures and muscle weakness. As such, his arms and legs, which are bent at odd angles, are largely useless for such ordinary endeavors as walking, driving, flexing, kicking, stretching, picking up objects, and playing video games (more on that later). As if that weren’t enough of a cross to bear, he also has multiple scoliosis. Indeed, everyday life is a struggle for Begum, but he doesn’t want to be pitied or fussed over, just treated normally with the occasional helping hand. He appreciates (and welcomes) the assistance he receives from friends and family, but he admits it’s not always easy asking for help—he hates the idea that he might be a burden on anyone. Begum has used an electric wheelchair periodically throughout his life, but he’s much more comfortable in a prone position than he is sitting up. Begum spends most of his waking hours flat on his stomach, using his arms and shoulders to prop up his torso and head. Sitting for too long in a standard position makes Begum sore and tired, so he avoids it when he can. When Begum was in elementary school, his (now deceased) father, an expert welder, converted an electric wheelchair into a motorized bed, meaning he can maintain the prone position for hours at a time instead of having to sit. Begum must be lifted onto the customized cart (usually by his brother and sister), but once in place he can move around pretty well. Speaking of moving around pretty well, Begum manipulates the images on his television set with surprising grace and fluidity, especially considering the limitations placed on him by his disorder. Watching Begum play video games, which he does by propping a controller in his hand and using his face to push buttons, is truly inspirational. In a recent interview, I asked Begum to describe his gaming method. Mike Begum was born April 26th, 1988 in Tampa, Florida, where his father owned an auto repair shop while his mother stayed home with the kids. The woman also told Mrs. Begum that her son would be a “great figure in the community” and “respected by all,” but that didn’t stop her from insisting that the woman leave the shop. Begum’s parents were devastated by this news, but over time they grew to accept what had happened. They loved their son, gave him the medical care he needed, and worked hard to make his life as normal as possible. In fact, when Begum was just two-years-old, they bought him something more befitting of a kid with fully functional arms and hands: a video game system. Begum’s father bought a number of games and would get his son to watch him play, but then something incredible happened: Begum, using his wrist and chin and a healthy dose of toddler ingenuity, figured out a way to play the games himself. Amazingly, after a few weeks of trying, the gaming prodigy beat Super Mario Bros. 3—a fairly difficult title for anyone to complete—before he turned three-years-old. Watching other kids engage in physical recreation, such as running down the street and playing tag, remains a painful memory for Begum. One day, when he was eight-years-old, the enormity of the limitations caused by his condition sunk in. With tears streaming down his face, he asked his dad why he couldn’t ride his brother’s new bicycle. His father didn’t say why, but Begum, experiencing a rather dubious epiphany, realized that he already knew the answer: he simply didn’t have the physical capabilities of the other children. Fortunately, video games, along with a prodigious imagination and the will to fight, helped Begum avoid a potentially depressing life and gave him a fantastic, readily available outlet for his pent-up energy, competitive nature, and desire for independence. Although he’s never tried the older consoles, such as the Atari 2600 or ColecoVision, Begum has owned almost every system released from the NES forward. His favorite all-time console is the Super Nintendo, which was a “huge part of his childhood” and has a “ridiculous amount of masterpieces” in its library, including his favorite game for the system, Mega Man X.
Begum’s current game of choice is Street Fighter 4, the popular one-on-one brawler for the Xbox 360. You wouldn’t necessarily know it by his otherwise kind demeanor and friendly, unassuming smile, but Begum is a ruthless gamer, taking delight in pummeling his more able-bodied opponents into the ground. Begum’s first tournament occurred at a video game store in 2005 during his junior year in high school, when he was visiting his mom in Houston, Texas. To the astonishment of those watching, he finished fourth in a field of 64 competitors. The game was Super Smash Bros. Melee for the GameCube. Begum, who now lives in Houston with his mom, was emboldened by the experience and elated by the fact that he could hold his own against most any gamer of any skill level, so he began competing in tournaments as often as possible. 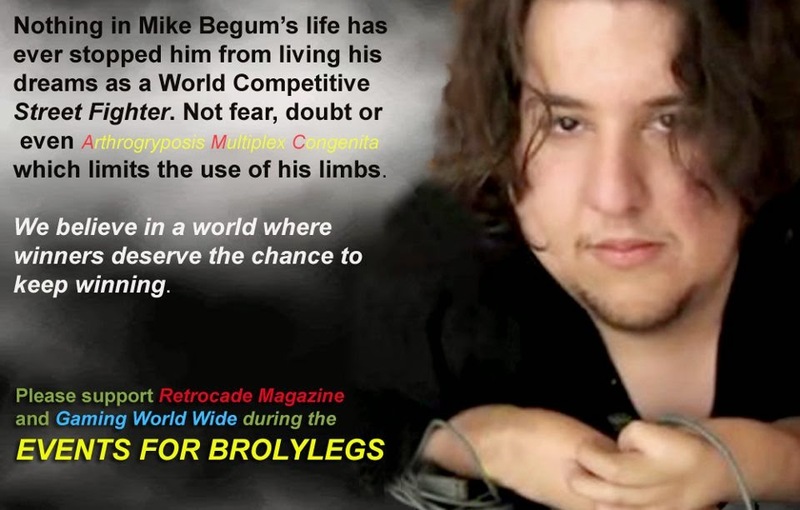 In 2011, when Begum heard about the Evolution World Championship in Las Vegas, Nevada, he was determined to go. EVO, as it’s commonly called, is the Super Bowl of fighting game tournaments. “Every year in July, players from all across the world fly in to compete in the biggest event of the year,” Begum said. “But this sort of trip was expensive, so with the help of my friends, a fundraiser was created to help get me there. 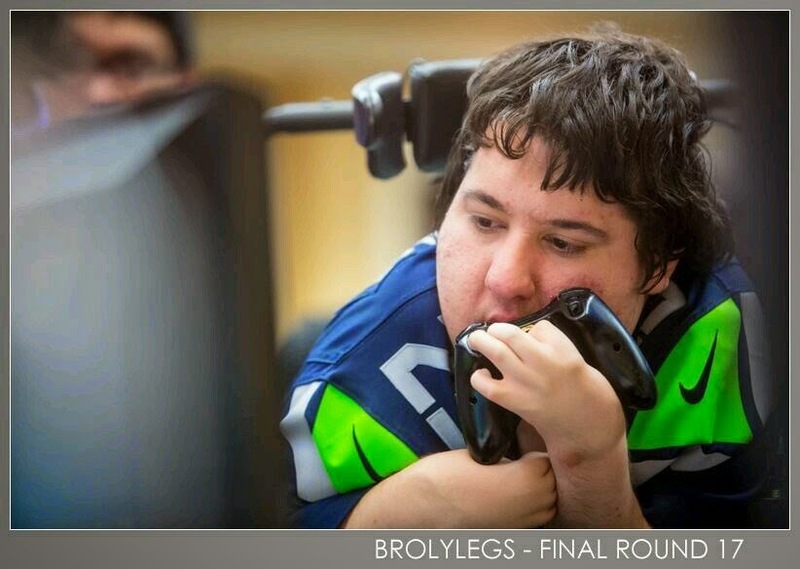 I was humbled by the help a lot of people gave me to get to the tournament,” where, much to his delight, he placed 64th in a field of hundreds of gamers. 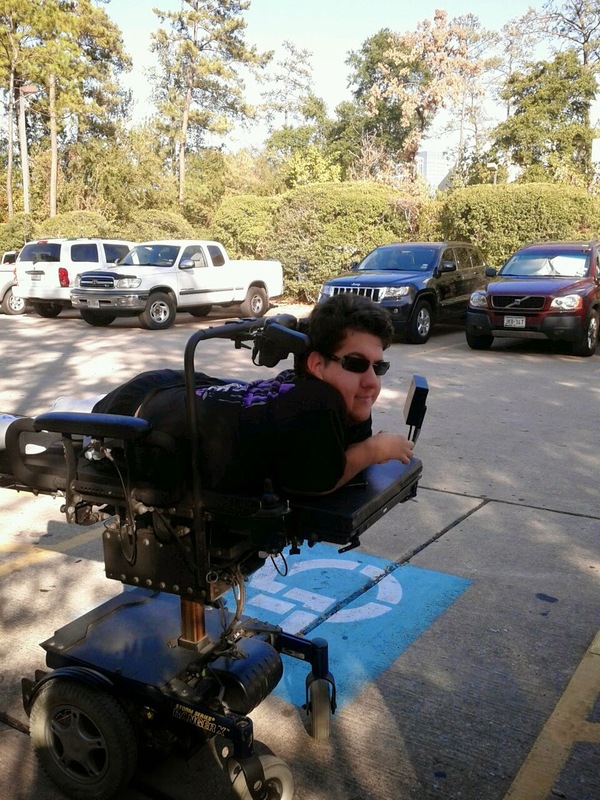 One of Begum’s biggest fans is Killeen, Texas resident Josh Jones, former event coordinator for a charity organization called Gaming World Wide, which was instrumental in getting Begum to the EVO tournament. After the interview, Jones setup up a live stream of himself playing Begum at Street Fighter IV, in which Begum is one of the world’s foremost Chun Li players. In addition to soundly trouncing fellow gamers at street-fighting sims, Begum, who has a bachelor’s degree in business management, hopes to tour the country one day, sharing his story in order to motivate others to succeed at their chosen field. He also wants to open a business where people could come to play video games while he provides tips and helps them hone their skills. 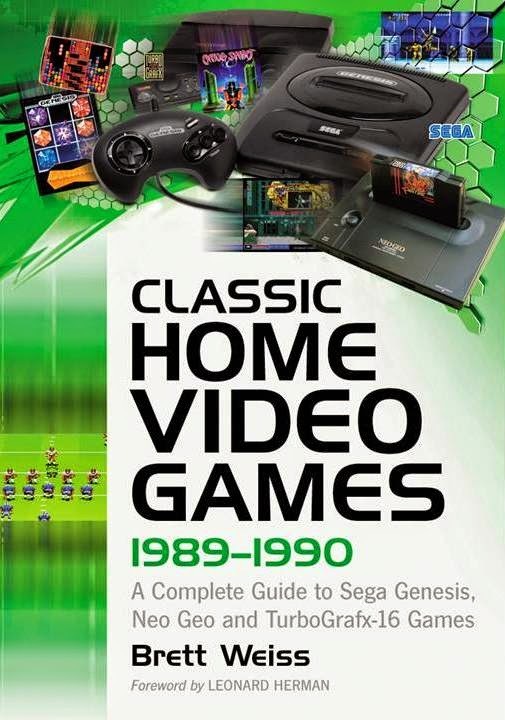 I've got a special going on right now with my "Classic Home Video Games" book series. Free media shipping with any purchase. And, of course, I'll autograph the books for free. Please send me an email if you'd like to order any of the books directly from me. I accept PayPal. 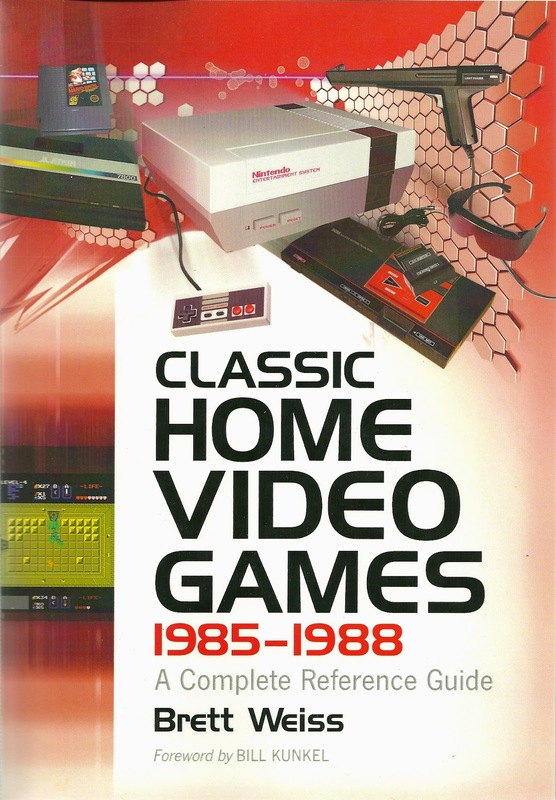 My new book, The 100 Greatest Console Video Games: 1977-1987, is now available. Check it out on Amazon. 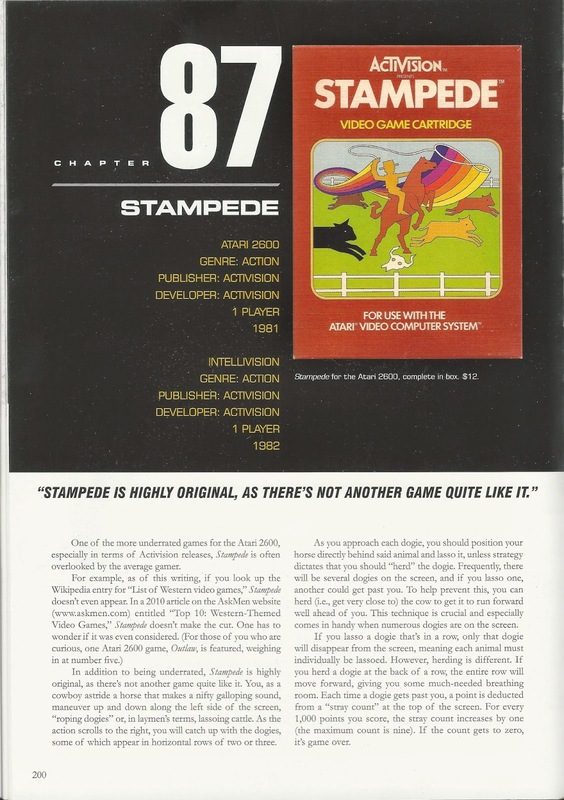 Below is the cover, along with a full sample chapter: Stampede for the Atari 2600 and Intellivision. CLICK ON EACH PAGE FOR A CLOSER LOOK. For your reading pleasure, here is the first chapter of my recent book, Retro Pop Culture A to Z: From Atari 2600 to Zombie Films. If you enjoy it, please consider purchasing the digital version of the book, or the large softcover. As always, thanks for reading! 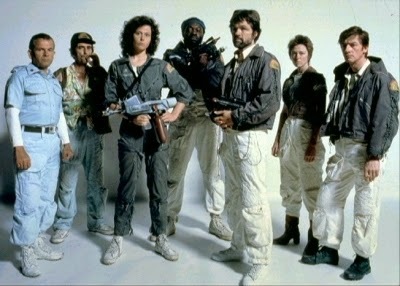 So goes the tagline for Alien, one of the greatest (not to mention scariest) science fiction movies ever made. Released in 1979 by 20th Century Fox, Alien was directed by the great auteur Ridley Scott (from a screenplay by Dan O’Bannon), who would achieve further fame in the ensuing years with such fantastic films as Blade Runner (1982), Thelma & Louise (1991), and Gladiator (2000). While certain science fiction purists of the day belittled Alien for its many monster movie moments, the film did earn its fair share of praise, including: an Oscar for Best Visual Effects; a Hugo for Best Dramatic Presentation; and Saturn Awards for Best Director, Best Science Fiction Film, and Best Supporting Actress (Veronica Cartwright). The story, which was influenced in part by the sci-fi B-movie classics It! The Terror from Beyond Space (1958) and Planet of the Vampires (1965), centers around the space freighter Nostromo that, reacting to an apparent distress signal, lands on a dark, dreary, windswept planet, and the resulting chaos that ensues. Said chaos comes in the form of horrifying, acid-dripping, H.R. Giger-designed monsters that go through several stages of increasingly scary metamorphoses, including an incubation period inside the human body. Needless to say, things don’t turn out too well for most of the Nostromo crew members--the chest-bursting business is particularly gruesome. 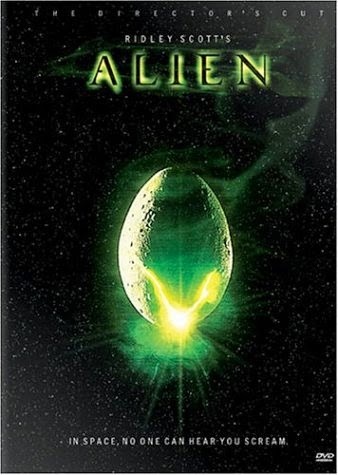 Thanks to its shockeroo thrills, gothic imagery, and iconic monsters (despite the singular title, there’re numerous aliens in the film), Alien is as much a horror picture as it is a sci-fi feature. The film oozes with creepy atmospherics from the beginning—the awakening of the Nostromo crew—until the end: Ripley returning to sleep after her nightmarish, but all-to-real alien encounter. Watching Alien today, the viewer realizes that it hasn’t dated a minute, from the dark, greasy, industrial design of the ship to the gorgeous visual effects to the quality acting of the ensemble cast, which includes Sigourney Weaver (Ripley), Tom Skerritt (Dallas), Veronica Cartwright (Lambert), Harry Dean Stanton (Brett), John Hurt (Kane), Ian Holm (Ash), and Yaphet Kotto (Parker). 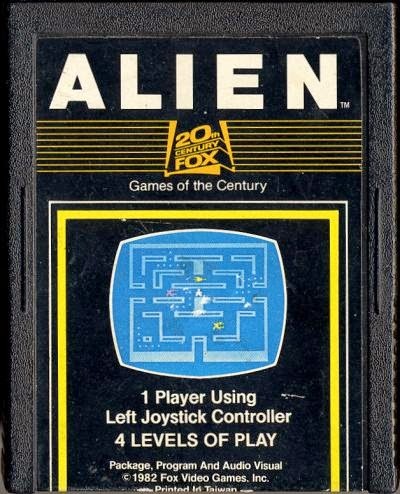 Now, the Atari 2600 version of Alien is another matter entirely. The game reduces the unqualified brilliance of the film to a simple maze game, one that shares much in common with Pac-Man (with some Freeway thrown in for good measure). With that bitter pill swallowed (so to speak), the discerning gamer is faced with two points of consideration: Is Alien a good Pac-Man clone, and is it worth playing. The answer, I’m glad to say, is a resounding “yes” on both fronts. The protagonist players control in Alien is a humanoid that is never referred to by any name other than “you” or “human.” Players must guide the stick figure-like being as he scurries around a top-down maze (though the player and the enemies look as though they are turned on their side), avoiding a trio of Aliens and gobbling dots (ahem, crushing Alien eggs) lining the pathways. The maze, which contains a pair of Pac-Man-esque side exits called hyperwarp passages, is supposed to represent the hallways in the hull of the Nostromo, but it is utilitarian in nature and largely unadorned. 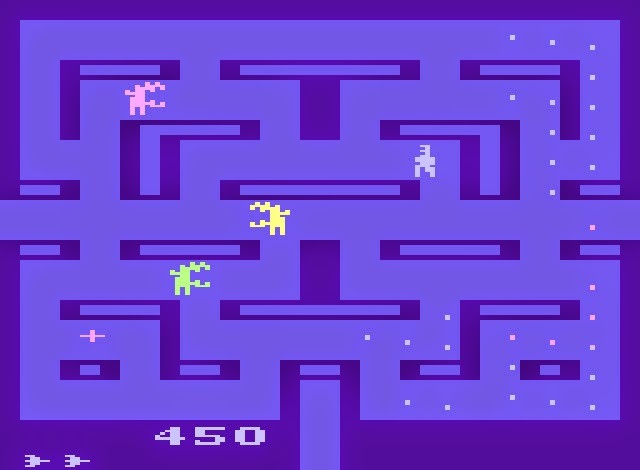 The Aliens roam around the maze in similar fashion to the ghosts in Pac-Man, but they enter from the bottom of the screen instead of the middle. To turn the tables on the Aliens, players can capture one of three pulsars (which parallel the power pellets in Pac-Man), temporarily turning the Aliens blue and making them vulnerable to attack. Players are also equipped with a weak, largely ineffectual flame thrower, which can be sprayed on an Alien to make it turn away or become immobilized for a short period of time. The coolest thing about the flame thrower is that spraying it as you run over a pulsar leaves that pulsar in place for later usage. In addition to eggs, Aliens, and pulsars, each maze contains a pair of prizes that grant extra points. After clearing a maze of Alien eggs, the player enters a brief, but oftentimes difficult bonus round, in which the human runs straight up the screen (to a prize at the top), trying to avoid getting run over by six “traffic lanes” of Aliens moving horizontally. This section obviously mimics Activision’s Freeway, but is less versatile and, like the main game itself, lacks two-player action. Alien is a fast, fun, and challenging game with tight four-way control and solid, serviceable graphics. In terms of audio, Alien’s “siren song” sound effects mimic Pac-Man pretty well. True, the Aliens look silly (certain reviewers have mockingly called them “chattering teeth”), but as movie games and Pac-Man clones for the Atari 2600 go, you could certainly do a whole lot worse than Alien. Fans of such maze classics as Jr. Pac-Man, Ms. Pac-Man, Jawbreaker, and Mouse Trap should at least give it a try. Unfortunately, not everyone agrees with my assessment of the game. 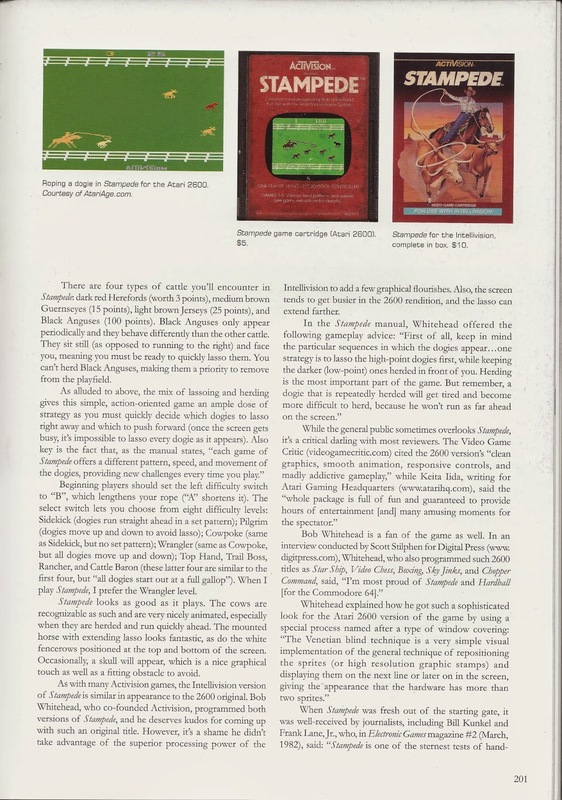 Keita Iida of Atari Gaming Headquarters (www.atarihq.com), unable to overlook the game’s lack of originality, gives Alien a lowly 50% rating (five out of 10, to be more precise). Tom Zjaba of Tomorrow’s Heroes (www.tomheroes.com) grades the game a C+, calling the Aliens stupid and easy to fool. This tells me that Mr. Zjaba should have played the decidedly difficult—no matter your prowess—game option three. Level 1: Player begins game with three lives; Aliens move at normal speed. Level 2: Player begins game with two lives; Aliens move fairly fast. Level 3: Player begins game with three lives; Aliens move very fast. Level 4: Player begins game with six lives; Aliens move slowly. Left Difficulty Switch A: Aliens move randomly around the maze pathways. Left Difficulty Switch B: Aliens move in fixed patterns around the maze pathways. Right Difficulty Switch A: Capturing a pulsar has no effect on the Aliens. Right Difficulty Switch B: Capturing a pulsar lets players turn the tables on the Aliens. 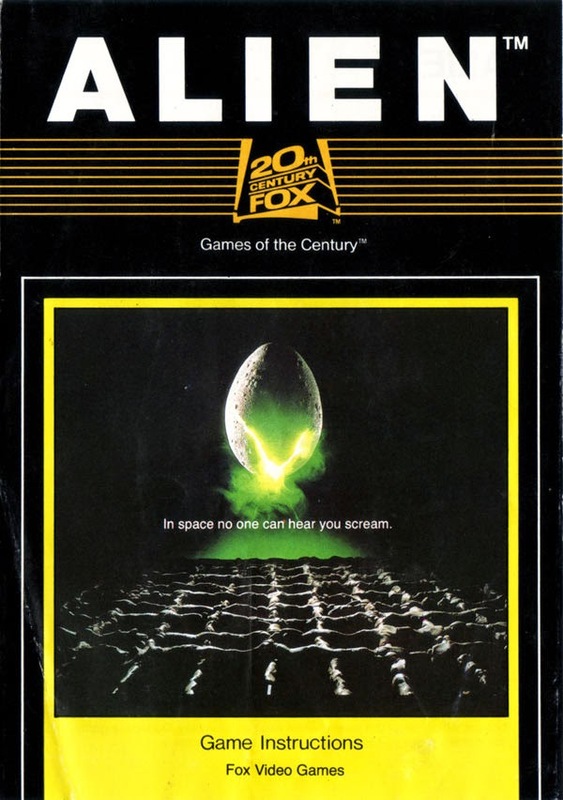 Fox Video Games, a division of 20th Century Fox, released Alien to little acclaim in 1982. 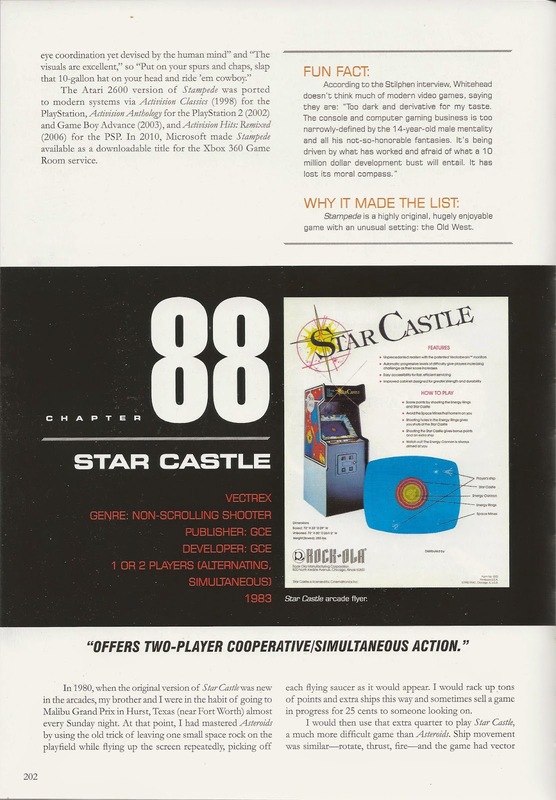 The game was advertised in the company’s 1983 catalogue, altering the film’s famous tagline to: “In your living room, everyone can hear you scream.” In addition, the game was listed under “Coming Attractions” in the 1982 catalogue. (Interestingly, the list also included five games that were never produced: 9 to 5, Six Pack, Entity, Tough Enough, and, most intriguingly, The Day the Earth Stood Still). Recently (relatively speaking), Alien has been the subject of a pair of homebrew hacks. Accessible via AtariAge (www.atariage.com), these include: Attack of the Mutant Space Urchins (2002) and Loco-Robo (2003), latter of which changes the Alien sprites to robots. 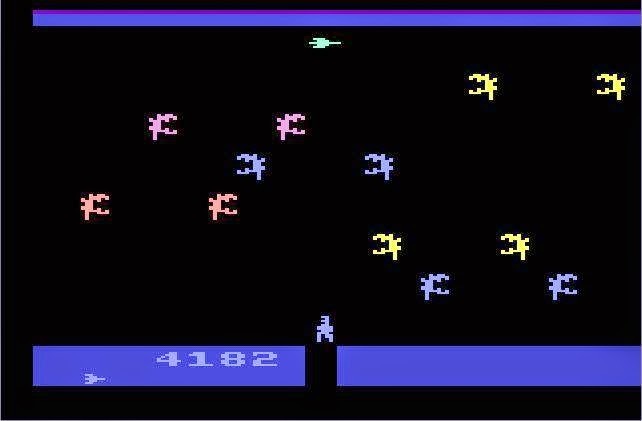 In the years since its release, Alien for the Atari 2600, unlike the film on which it is very loosely based, has been largely vilified by purveyors of popular culture. It is almost always written off as a mediocre (or worse) Pac-Man clone, but, at least in my opinion, it deserves a spot in any maze fan’s library of classic home video games. In fact, if the disastrous, industry-crushing, needlessly convoluted E.T. The Extra Terrestrial had taken the same simple route (imagine E.T. walking swiftly around a maze, dodging hostiles while giddily gobbling up Reese’s Pieces), the infamous Great Video Game Crash of 1983/84 may have been turned out a bit differently. That may be overstating things somewhat, but that’s my take on Alien, and I’m sticking to it. 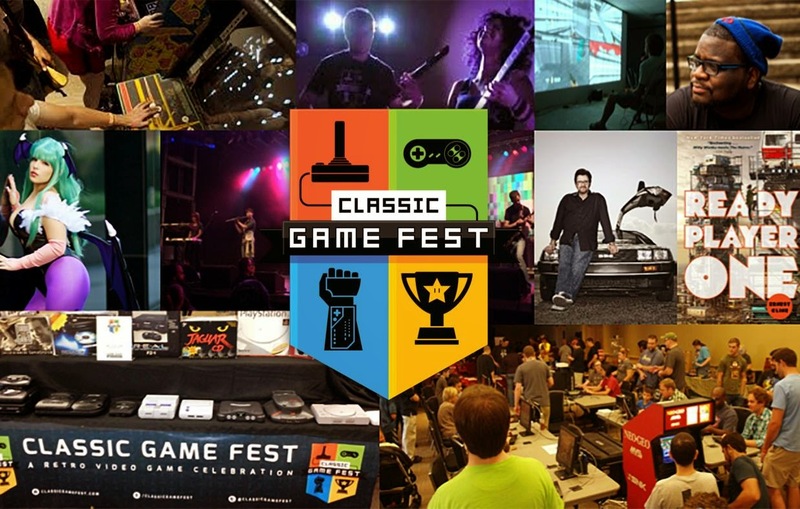 If you enjoy video games, come down to Austin this weekend for Classic Game Fest! 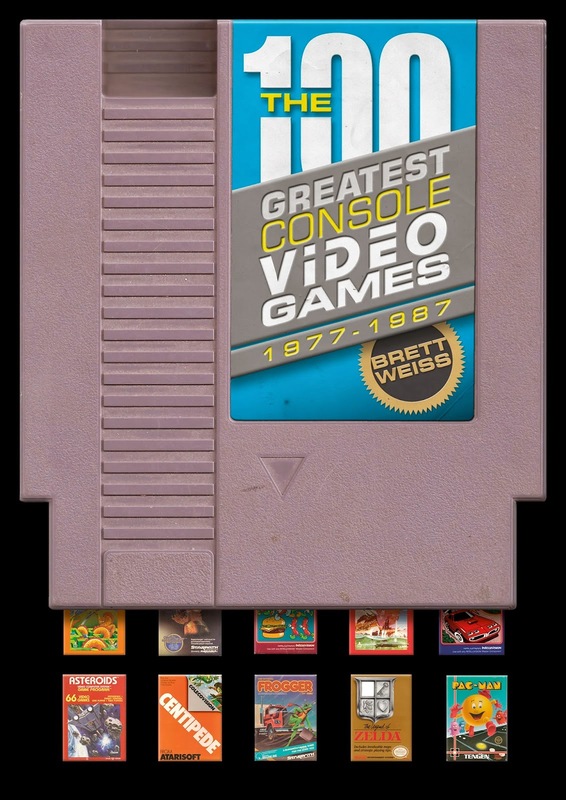 If you pre-order my new hardcover, full-color book, The 100 Greatest Console Video Games: 1977-1987, you can get it for just $26.16, nearly $10 off the cover price. Order your copy today! A lifelong fan of comic books, video games, movies, science fiction, and the like, Brett Weiss has published professionally since 1997 and today is a full-time freelance writer. 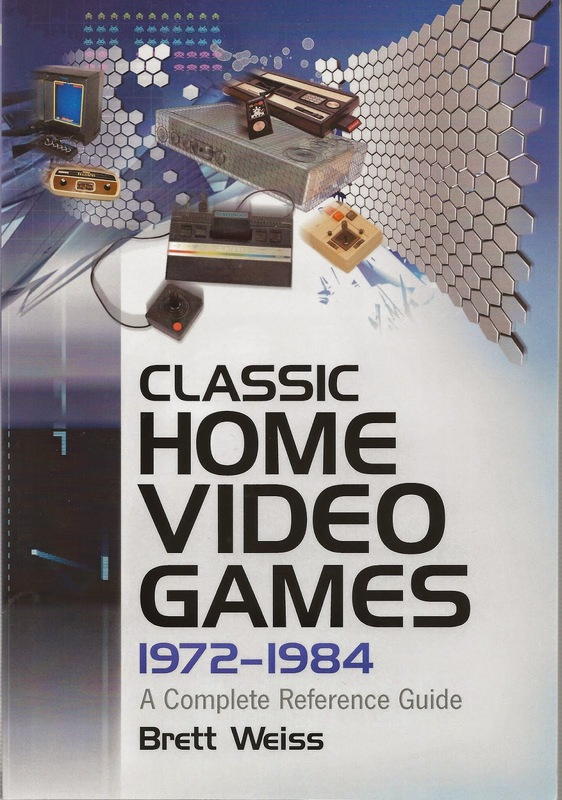 Weiss is the author of six books: The 100 Greatest Console Video Games: 1977-1987 (Schiffer, 2014); Retro Pop Culture A to Z: From Atari 2600 to Zombie Films (Amazon Kindle, 2013); Filtered Future and other Dark Tales of Science Fiction and Horror (Amazon Kindle, 2012); Classic Home Video Games 1972-1984 (McFarland, 2007); Classic Home Video Games 1985-1988 (McFarland, 2009); and Classic Home Video Games 1989-1990 (McFarland, 2011). In addition, Weiss has had articles published in the Fort Worth Star-Telegram, The Writer, Mystery Scene, AntiqueWeek, Antique Trader, Fangoria, Filmfax, Game Informer, Video Game Trader, Classic Gamer Magazine, the Comics Buyer's Guide, Toy Shop, Toy Cars & Models, Back Issue magazine, Alter Ego, Robot magazine, Native Peoples, and various other publications. He's also been honored by video game legend Walter Day with two cards in Day's Twin Galaxies trading card set. When not writing, Weiss enjoys reading, hiking, cycling, playing basketball and tennis, watching movies, going to museums, collecting video games, and hanging out with his family. Weiss lives in Fort Worth, Texas with his lovely wife, who is essential in helping him with various computer and photography conundrums that frequently arise; his two wonderful kids, who do a great job of making life fun; and two crazy dogs and a fat cat.